One for the Modern Vespistas. Tender Love & Carry is a New Zealand based brand of cosmetic, toiletry and travel bags. This bag is made from a durable outer fabric and is on sale for $16.67 (from $22.22). For this price it might also make a great tool bag for your glove box. It’s dimensions are approximately 8.6″ x 5″ x 4.3″. 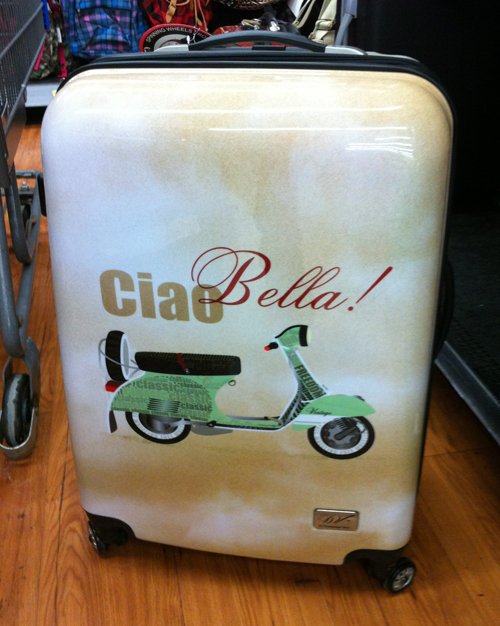 This rollie suitcase was recently spotted in a Walmart up in Canada for $80. Thanks to Glen B. for the find and the photo! SugarBooger and ORE originals have teamed up to put out this line of food totes called “Road Trip” that features a Vespa. Best of all there is everything but the kitchen sink included in this collection Prices for pieces range from $8.50 to $40.00. You can find the entire line here at the ORE site or here on Amazon . Thanks to Cassie M. for this terrific find! More scooter posh from Jonathan Adler. 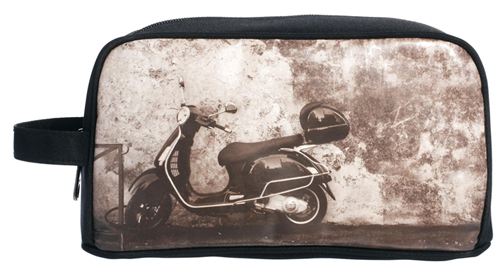 Here’s a $42.00 sunglass or eyeglass case from the always stylish (and expensive) Jonathan Adler who obviously has a fondness for scooters. (Good on him!) It’s handmade needlepoint on wool on one side and velvet and the Adler monogram on the back. 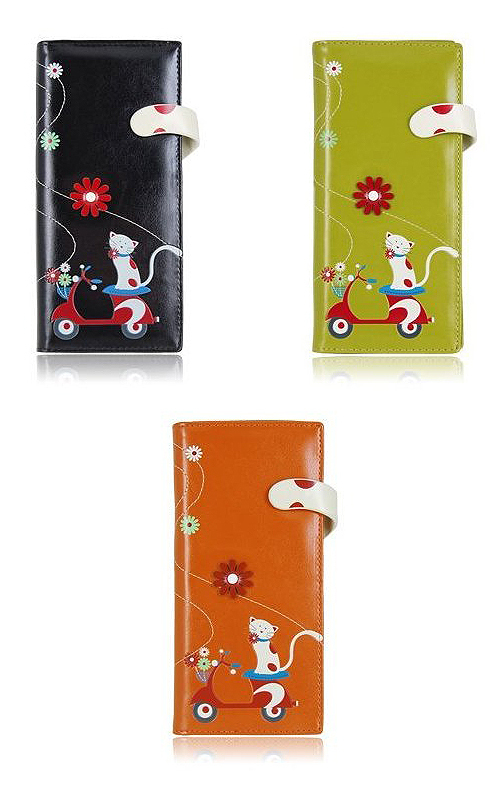 It’s padded inside and measures 3.5″ X 7″. The ties are silk/cotton and $95.00 each. To see other Adler swag we’ve posted click here . To see the eyeglass case and the ties, click here. Despite the fact that I have been surrounded by Menchie’s frozen yogurt shops everywhere I have lived, I’ve never actually seen one. So if you’re not as oblivious as I am, visit one of their stores to pick up a “Moto Fro-Yo” insulated bag with their mascot riding a pink scooter. It runs around $9.99. I’m also including some other scooter imagery from a quick web search. To find a Menchie’s near you (and they’re very international) click here . Thanks to Heather M. for this find! Scooters show up a lot in Lulu’s accessories. 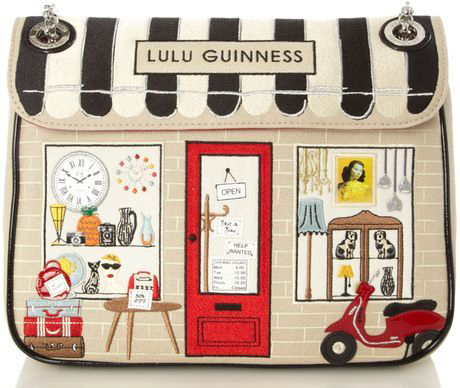 I love shopping and I love scooters but the two are often hard to combine unless you have a big luggage rack and lots of bungies ; ) This purse can be worn as a shoulder or cross-body bag and will set you back Â£295.00. 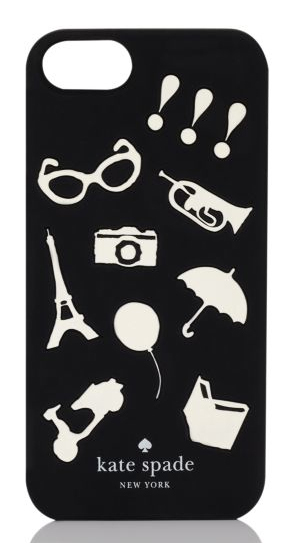 A few of Kate Spade’s favorite things. Here’s a phone case for your iPhone 5. Made of silicon and priced at $35. Thanks to Melissa L. for this find! These seem to be part of a new line for HK but so help me I can’t find a source for them. Good luck on eBay! It seems like these were available at Claire’s Boutiques at one time. But no more. Espe â€” a Canadian accessories maker â€” has long been a maker of scooter friendly stuff. The leather purse with the dog and the scooter on it that just about everyone had about 5 years ago? Made by Espe. They recently did a similar design but this time with a cat. The design is called “Felicity” and alas by the time I got this post up (it’s only been a month since I got the tip â€” I swear!) the Espe site no longer features the Tote Bag, Wallet, Coin Purse or Card Holder it once did. Boo! I did find some links for the wallet on Amazon. It’s $30 and holds bills, coins, IDs and cards with 14 card slots, 4 bill slots and 1 coin zippered compartment. The other accessories can be found by intrepid searchers of the Google and the eBay. Thanks so much to Heather M. for this find! Sorry I wasn’t faster on the uptake.